Hey, look. I won. Hooray! Just ignore the fact that it says I wrote 4100 words today. I actually wrote 4000 before the month began and I just kept them in the same document, so they showed up when I validated. 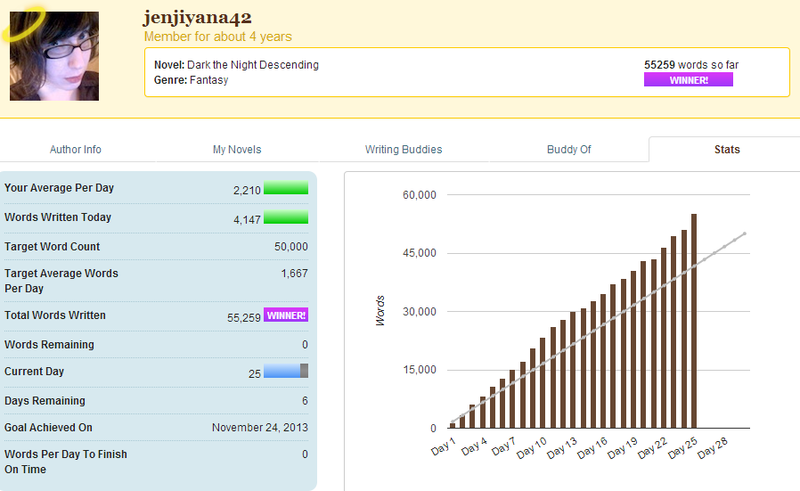 I swear on my honor (and my stats chart) that I completed at least 50,000 of them starting November 1. The month ended early this year after a pretty smooth ride with a book I think I really like. I haven’t quite figured out how it ends yet, which could be a bit of a problem, but I do hope to finish it up in the next month or so and maybe possibly if I’m very, very lucky (fingers crossed), publish it sometime in the spring. That would be cool, right? Yeah. Arran Swinn knows about nightmares. They killed his father. When the sun goes down, the Siheldi come out, and surviving the onslaught of the demons until daybreak can be little more than a gamble without the right protection. Thanks to a fortuitous gift and a little trickery, Arran can provide that protection these days – for the right fee. Guiding merchants along the haunted trade routes is easy money, right up until he takes on a passenger who proves to be almost as bad as the Siheldi themselves. With the daylight fading and the ocean rising, he finds himself saddled with a dangerous cargo, a bargain he can’t keep, and the unwelcome scrutiny of Megrithe, a tenacious inspector intent on seeing him hang for his misdeeds. Pursued by the sea-dwelling neneckt into a world drowning in its own deceit, Arran much decide just how much he’s willing to sacrifice to the spirits that have had him marked out since the night his life changed forever. Good for you! My work life and other responsibilities keep messing with my productivity! I need to do 3000 words every day this week to make it. Arg. Arg. Arg.